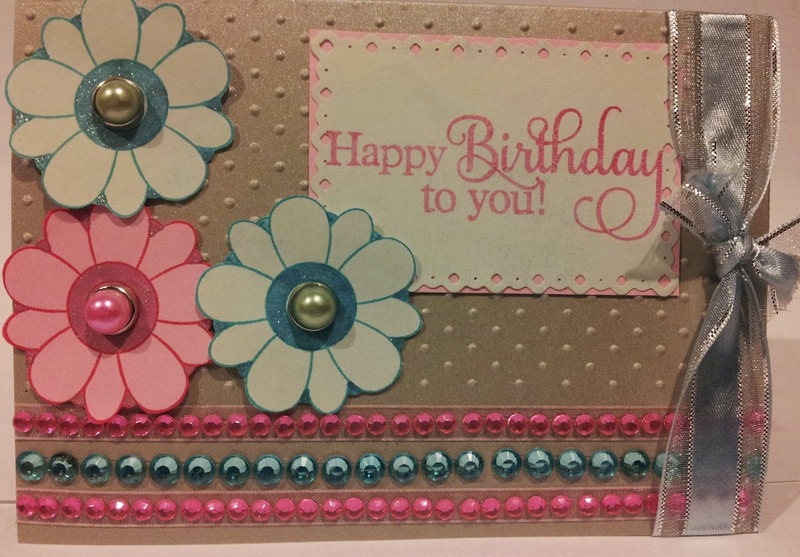 Hi everyone, today I finally completed a challenge card for the Inspired By Stamping challenge using pale pink, pale blue and grey. The challenge tag is: IBSIC #64. I found this to be a real 'challenge' for me, being limited to three colours was quite difficult and until this challenge I hadn't realised how little 'grey' I had in my stash! The card base is pearlised grey cardstock with the top and back side dry embossed with the swiss dot folder. I put pale pink ribbon in two strips on there, but as it was an organdy ribbon it was really hard to see (see through) so I added lines of pale pink bling on there with pale blue in the middle. The sentiment stamp is from Inspired By Stamping, where as the flower stamp is from a freebie from a card making magazine. The flowers were stamped onto pale blue and pink cardstock, fussy cut out and then I coloured in parts with sakura gelly roll pens in pale pink and blue. And finally to cover the right side of the card where all the bling didn't line up with the card edge properly I put a bit of gorgeous blue ribbon from my stash - so glad I bought that one years ago! Oh and the sentiment was cut out on my cuttlebug with a spellbinders romantic rectangles die. Well done, lovely card Karen, and I was the same with the grey,,,had to search for a pc of card in my old scraps, but will get the new pale grey, think it's called slate, from SU next order, it's lovely with pink! 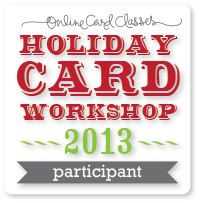 Pretty card - love the bottom bling~ Thanks for joining in with IBS! Thanks again Joanna - don't you love it when a mistake can be fixed to look like it was meant to be?! I actually tried another card before this one and it was just stuck, I gave up on that and came out with this the next day - sometimes you just have to step away and come back with fresh eyes. Thanks for visiting my blog. Thank you Leah, I'm loving how IBS challenges are making me think outside the box and go in new directions! Love this, Karen! Not sure how I missed it before, but glad I eventually found it! Thanks Cheryl! Notifications are not coming for the comments I'm getting either! ...maybe I need to figure that out.